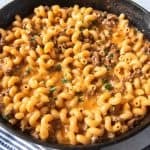 One of our go-to dinner recipes when we are in the throes of busy school schedules and extracurricular activities and I haven't planned ahead is this Homemade Hamburger Helper Cheeseburger Pasta Skillet made with browned ground beef, shredded cheddar cheese, and cavatappi or macaroni noodles. It's may not be fancy, but it's always easy, satisfying, and a hit with my family! Heat a large skillet over medium high heat, then add the ground beef and break it up, cooking and stirring until the meat is no longer pink. Drain any remaining fat in the pan. Sprinkle the cornstarch, paprika, garlic powder, onion powder, salt, sugar, and pepper over the browned meat and stir well to evenly distribute the spices. Add the hot water, milk, and pasta, then bring to a boil. Cover with a lid, reduce heat and simmer for 8-11 minutes, or until the pasta is al dente. Sprinkle the grated cheddar cheese over the cooked pasta and stir until melted into the sauce. Remove from the heat, and let stand for a few minutes until the sauce thickens a bit. Garnish with freshly chopped parsley, if desired, then serve. Recipe adapted from Dinners, Dishes, and Desserts.